The all-new Super Duty Series of Ford’s trucks has been on sale since late 2016. Like their smaller, best-selling companion F-150, the redesigned Super Duty trucks use the aluminum-made body panels. The models also have beefed-up underpinning, new interiors, plenty of tech and convenience features and upgraded engines. The smallest in the Super Duty Series, Ford F-250 can tow up to 18, 600 pounds and like other models offer a wide range of customization options. The new version of this truck will be the 2018 Ford F-250 but this model will continue to the new model year almost unchanged. After such thorough redesign, which is rare in such scope in the whole auto industry, the new F-250 won’t change much for the new model year. Ford will likely make some changes in features organization and availability and new exterior or interior package can be introduced but other deeper changes are not expected. From the visual perspective and structurally, the new 2018 Ford F-250 won’t change. Ford planted the redesigned F-250 and other members of Super Duty Series, on the beefed chassis with larger rails and crossmembers which are made of 95 percent high-tensile steel. On the other hand, more dent-resistant and lighter aluminum has been used for the body panels. These enhancements, provide higher towing limits and better performance while in the same time these trucks are lighter. The styling of the redesigned F-250 has also been improved and the new version looks more macho. In that context, the new model year won’t also bring new modifications. The model will have two-bar style grille and C-shaped headlights. Muscular hood and pronounced fenders will also add to model’s appearance. The truck will also have the tailgate with prominent stamping and each trim will add unique accents and features to model’s exterior. Interior of the models will be well-quipped and new-generation cabins are also larger and more comfortable. This truck will also include comfortable seats with muliticontour option in higher trims. Inside the cabin, the model will also include the latest infotainment features and each trim level will add more luxurious tech and convenience features. The new version will be available in regular cab, extended cab and crew cab body formations and two-bed lengths will also be in the offer. High level of configuration will also be provided through the XL, XLT, Lariat, King Ranch and Platinum trims. Under the hood of the 2018 Ford F-250, the base engine option will include the familiar 6.2-liter V-8 engine. This engine can produce 385 hp and torque of 430 lb-ft in its current form and further upgrades are not expected for the new model year. However, if buyers need a higher power and towing capability the 6.7-liter turbodiesel V-8 will be available. This engine provides 440 hp and class-leading torque of 925 lb-ft. Like the base engine, this powerplant will work in combination with the six-speed automatic transmission. The standard will be rear-wheel drive and optional all-wheel drive. 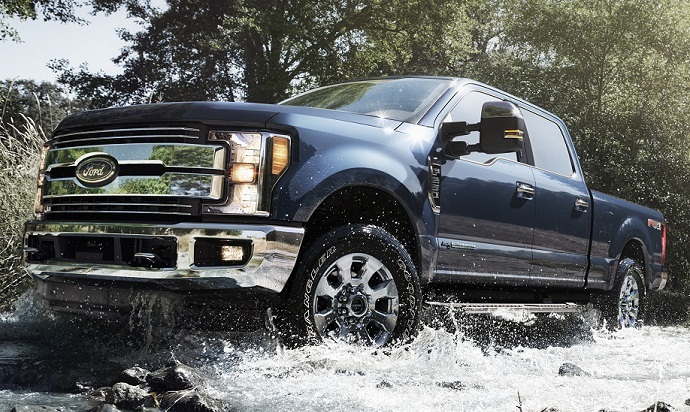 The F-250 will, on the other hand, allow up to 18, 600 pounds of towing capacity. The most capable payload configuration will allow up to 4, 200 pounds. The 2018 Ford F-250 will arrive late this year. The price range should start from around $34, 000. I would like to see the ability to add a height for the gps and mapping!! I haul a 5th wheel trailer and it is 13 feet 2 inches tall and there is no place to enter that info!! Many of the owners use these to haul 5th wheels and trailers and this option would be very useful to us!! would like to see rear air suspention, get back the limit spin diff!